Most of the National Parks we go to are fairly well-known. I mean, there are only 59 of them, so most are familiar to the masses. 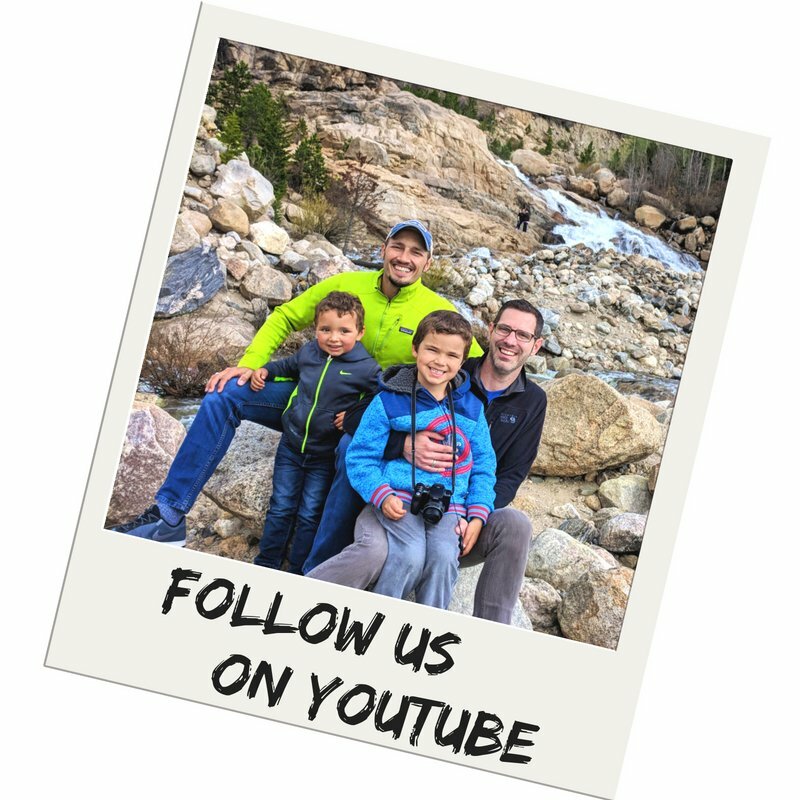 We love to return to Glacier National Park and Olympic and such because we’re so familiar and there is so much to do and see. 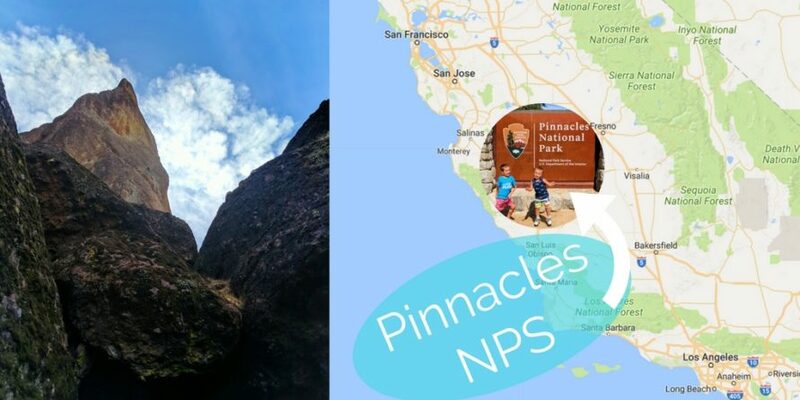 We just added a new NPS site to our repertoire though, and we are so glad that Pinnacles National Park met and exceeded our expectations. 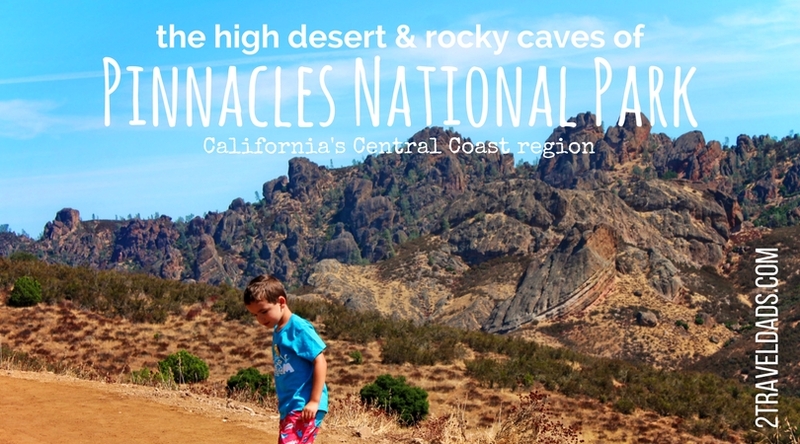 If you haven’t heard of Pinnacles National Park, it’s because it’s the newest addition to the National Parks. Formerly a national monument and jointly managed by the National Park Service and National Forest Service, the area was converted to a National Park giving it more, different funding and programs, and also bringing it to the forefront of many hikers’ and travelers’ minds. Huzzah for the upgrade and now check it out! 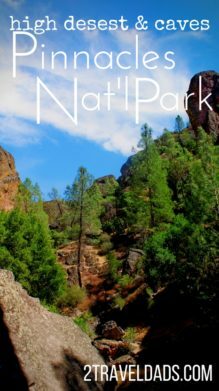 Pinnacles National Park is located between San Francisco and Los Angeles off Highway 101. 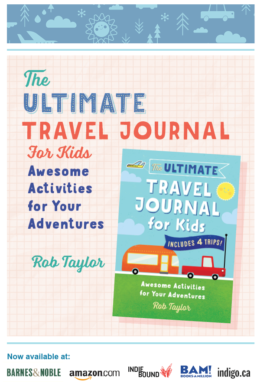 It’s not exactly sitting on the side of the road so you do need to actually plan for some time in the Park and make sure that you have ample supplies for your jaunt (see below). 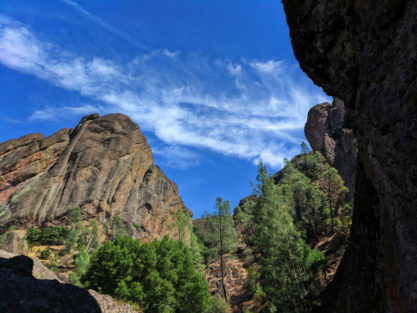 There are two different ways to access Pinnacles National Park: from the west side off Highway 101 or from the east side coming from the San Benito area. 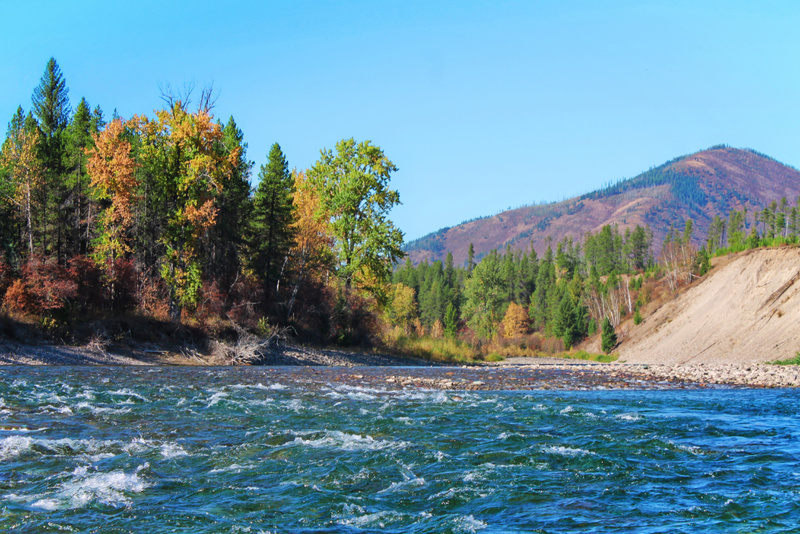 The east side is where you’ll find camping and all kinds of other trails different from what we are going to tell you about, and then the west side is where we focused. 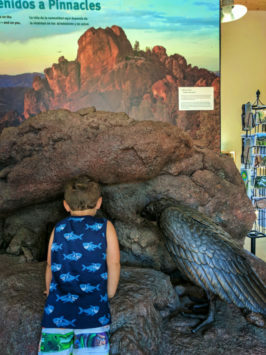 Here you’ll find some sweeping views, a few different types of ecosystems, a Visitor Center, and of course the talus caves. If being on a road trip isn’t your cup of tea that’s okay. 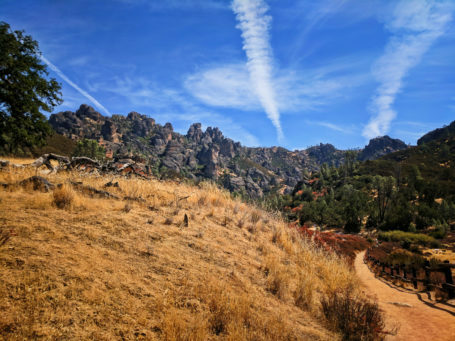 You can still visit Pinnacles National Park from the Bay Area as it’s less than a two-hour drive. It’s close to Monterey and also just North of San Luis Obispo and Cambria. 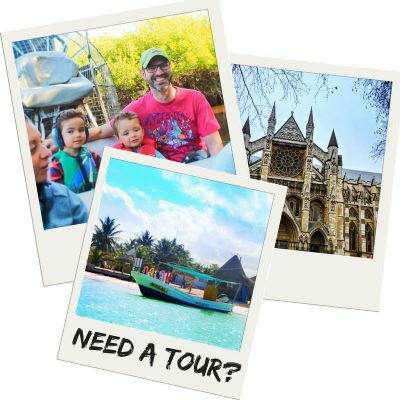 You could make an easy weekend trip of doing Hearst Castle, Wine Country, and Pinnacles and really make the most of your time and get the best bang for your buck. 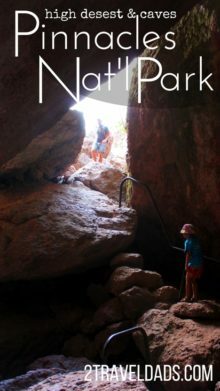 Because the Pinnacles are an ever-moving, ever-changing landscape there are lots of cool geographic features to explore. 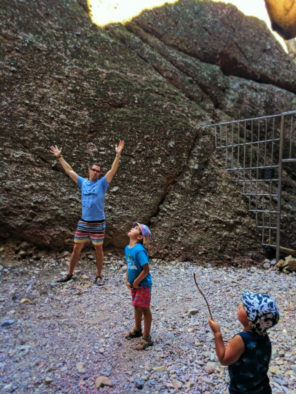 The Pinnacles are a hit with rock climbers, hikers and horsemen. We opted to just go the hiking route on this trip, but next time we’d love to see the Park via horseback. 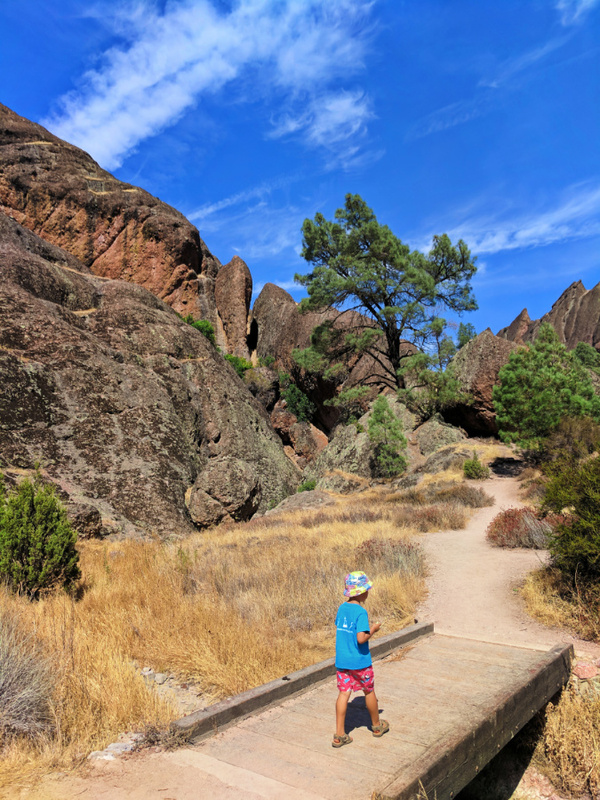 Someday, if the kids are interested and we can train for it, Pinnacles National Park would be at the top of our rock climbing list due to the views, colorful rocks and structured climbing routes. Whenever we visit a National Park we always make sure to stop in at least one Visitor Center. This is where we get our National Parks Passports stamped as well as where we can either pick up or complete our Junior Ranger program packet. 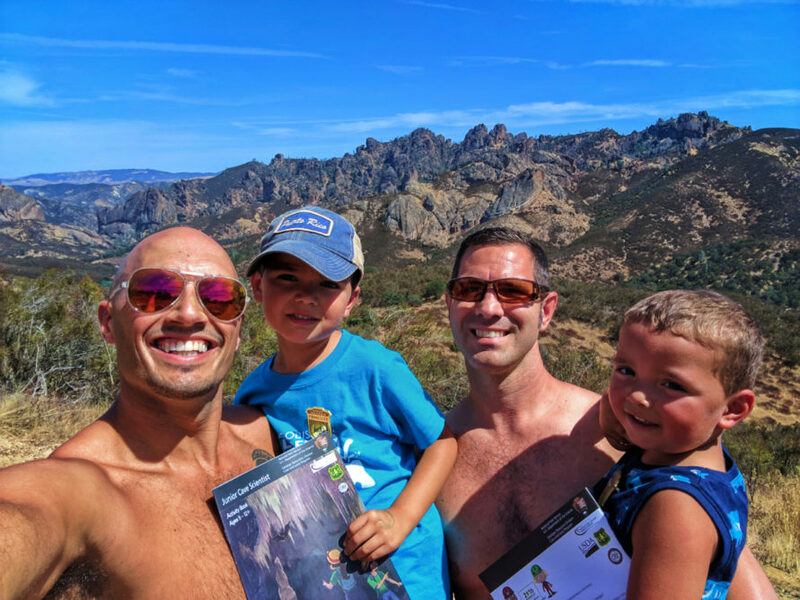 In the case of Pinnacles National Park, we had already printed off the Junior Ranger packet at home and completed it as part of our homeschooling curriculum that we do. 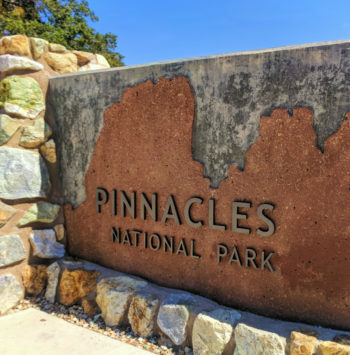 This gave us the opportunity to watch some videos on YouTube about Pinnacles National Park as well as do some additional research around the California condor and the Townsend big-eared bats, both of which are endangered and found within the park. 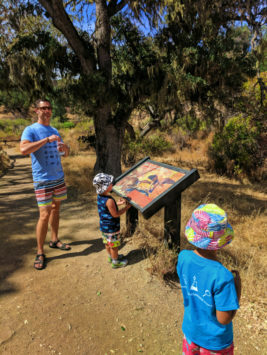 Once out on the trails at Pinnacles National Park we were able to see several exhibits around what we had already learned about in our Junior Ranger packet. 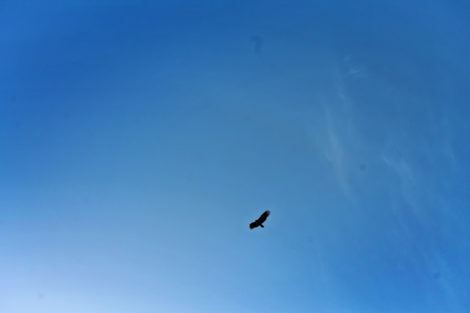 And as we hiked we were also able to keep our eyes peeled for any California Condors we might spy soaring above us. We actually were able to spot two of them during our time in the park! Tip: you can tell a California condor versus a turkey vulture by not just its size but because of the white triangular patches on the underside of its wings. There are some big vultures out there, but when you see a condor you’ll be able to tell the difference with binoculars. 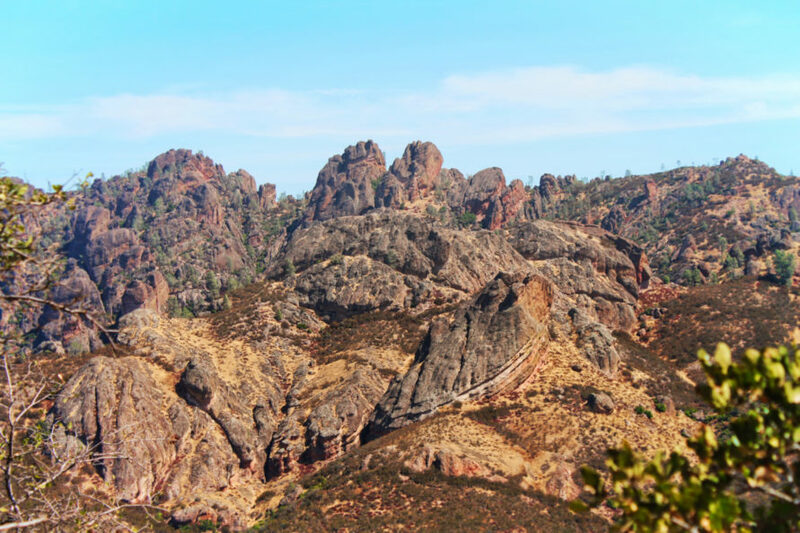 Since we focused on the west side of Pinnacles National Park that’s where we are going to share our hiking stories. What you’ll find on the east side we cannot attest to (yet!) but I can’t imagine that spending time in the eastern half would be just as awesome if it’s at all like where we were. We are big fans of hiking trails that are loops. 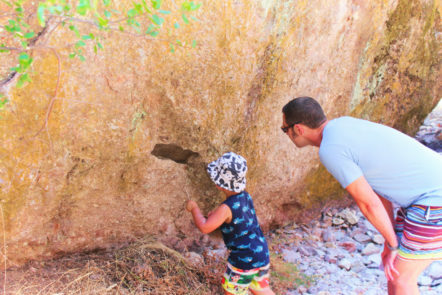 This is so helpful when you are hiking with kids and in Pinnacles National Park this was such a blessing. Going directly out from the on the west side Visitors Center we were able to do the hike along the skyline ridge. The entire hike is quite exposed in the sun so you want to be prepared with hats, sunblock and water. The entire loop trail is just over a mile and a quarter, but that short distance will wear on you. The skyline trail takes you along one of the hills that is not a pinnacle but has some sweeping views of part of the Pinnacles range. 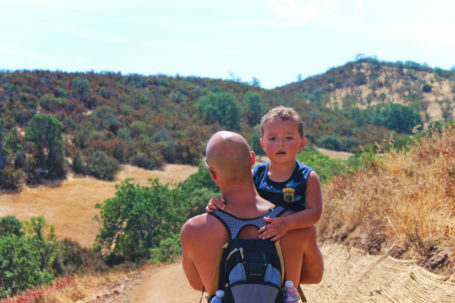 We didn’t see much wildlife on this particular trail except for birds, but we were also hiking in the heat of the day. Animals like to be active when it’s much cooler. Tip: try to plan desert hiking for early in the day or in the golden hour before dusk for the best temperatures. When it comes to the vegetation, wow, it was some of the strangest mixes of plants we’ve seen. This area is called the chaparral which is a kind of high country desert. 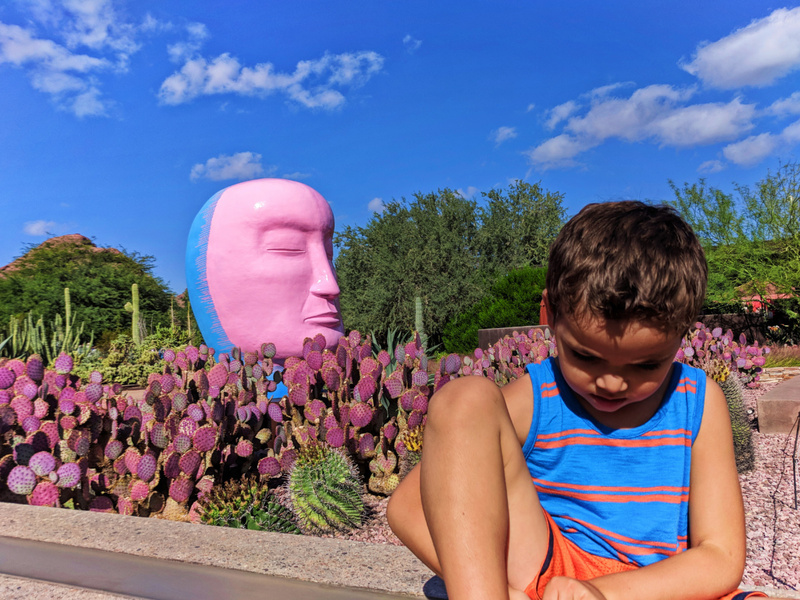 That doesn’t mean it’s full of sand in cactuses, but it means that the plants grow in an extremely arid and harsh environment. Think tumbleweed after tumbleweed after buckeye tree after tumbleweed… Really strange. 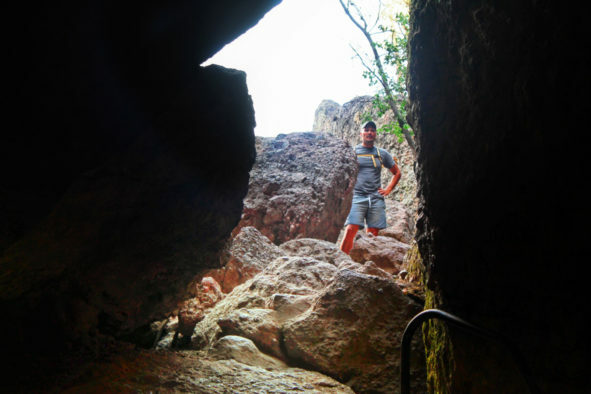 Hiking to the talus caves was one of the main reasons we wanted to visit the 59th National Park. 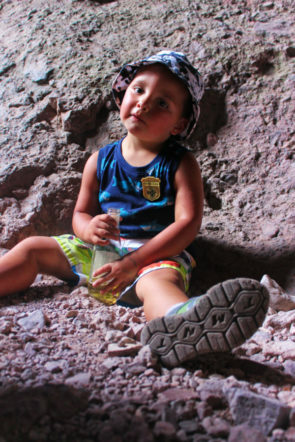 We love to go caving with the kids and each cave is so very different. Last year we got to do Oregon Caves National Monument down in southern Oregon and it required climbing ladders and ducking down in pitch black areas while water dripped all around us. And then this summer we did the Cave of the Mounds in Wisconsin and that was very much a family-friendly cave to explore with some impressive underground structures and interesting sights. 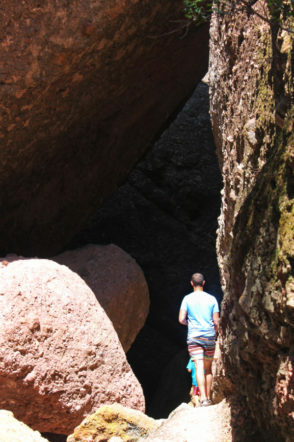 The talus caves in Pinnacles National Park are NOT like either of these. If you’re unfamiliar with the term, talus is fallen rock. Because the pinnacles are continually moving and changing, large pieces of rock have fallen over the years and jarred each other in crevices and canyons. This has actually formed some very complex caves. They aren’t caves like the limestone ones full of stalactites and stalagmites that you might go through, but caves in terms of crevices and shelters with gaping holes where the rock doesn’t meet. This means that many areas are well-lit but also there are some unexpected drops into darkness. 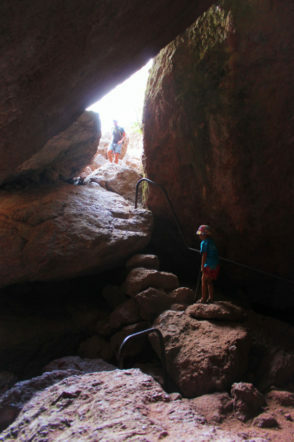 It’s pretty cool, both the caves and the canyons, for exploring with kids. Had there been recent rain there would have been creeks to cross along the hike as well. Part of what makes this trail so neat are the cliffs that you are walking alongside. Most of them are overhangs, also called balconies, and many are covered in lichens and jagged rock faces. Buckeye trees also line the trail in different areas, so that just adds to the weird/cool factor. Note: buckeye trees are very unusual in that during the summer time they don’t have leaves and their strange fruits are growing and developing on the branches. In fall the fruits are dropped and then the Buckeyes sprout leaves during the winter and then start their cycle all over again. Visiting this area isn’t something you’ll get to do often, I’m sure, so take the time to be safe and prepared for the best experience possible! 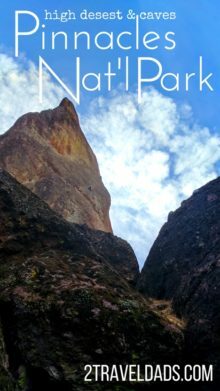 Don’t you think Pinnacles is such a cool and obscure Park to visit? 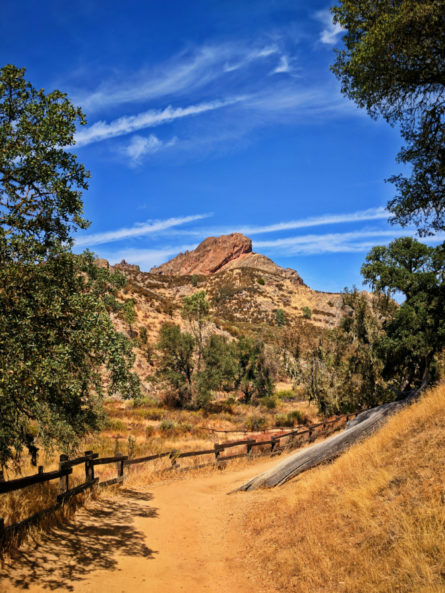 We’re looking forward to going back and entering from the east side of Pinnacles National Park so that we can see what it’s like on the other side and actually do some camping. 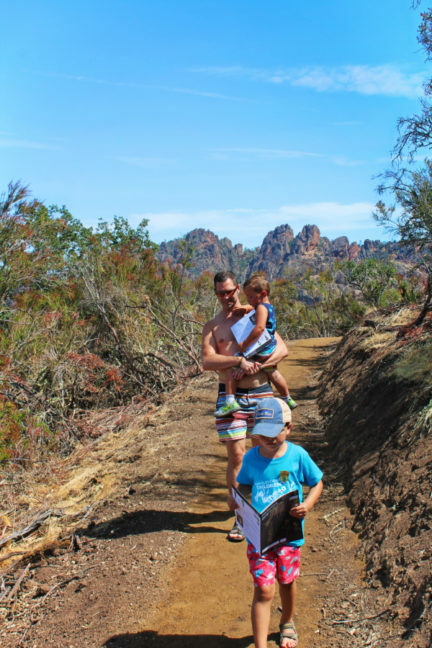 If you have any other great tips for exploring the Pinnacles and surrounding areas, please let us know. We really enjoyed it there and appreciated the rugged, dry beauty of the place, so I know we’ll be back ASAWC (as soon as we can). 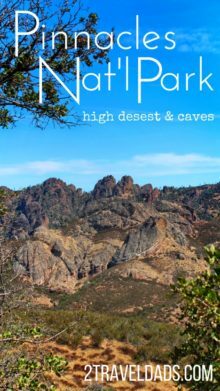 Want to stick a pin in Pinnacles National Park for your own California National Parks trip planning? Go for it! This is amazing. If my wife and I ever have kids I hope I can give them half the experiences your kids are getting. Love it! I have never been! I am gathering ideas for my end of year shut down. This looks good because it is not that far from home. And, it is gorgeous (plus, National Parks are my thing). Wonderful! As rock climbers and cavers, this place would definitely be a paradise for us. Are there bolted climbing routes there? There are!! The balconies trail had several clearly marked ascent spots with bolts. If you look through the pics in the article, the one pinnacle that’s very triangular against a blue sky has climbers on it. Amazing place! Every established climbing route is bolted. There are about 900 or more of them. 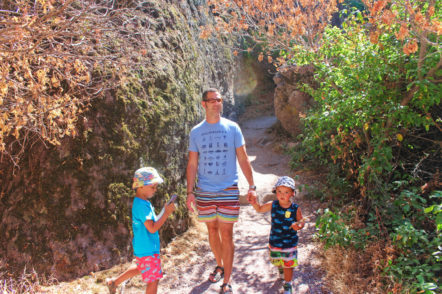 Great article on the Pinnacles. Glad you enjoyed your trip there. Just a few things for clarification. The area is not considered High Desert. It is coastal inland chaparral. Yes, it does get extremely hot there in the summer and early fall, but it’s not a desert. The trail you mentioned as the Skyline Trail, it’s actually called the High Peaks Trail. And lastly, you would not be able to ride a horse on the trails there. The trails are for human hiking only. The park does have horses but there only for park personnel performing trail maintenance.